We were happy to partner with The Running Powerlifter for this delicious and easy Caribbean-Spiced Chuck Roast recipe! I’m one of those eat-the-same-meals-every-day kind of people, much to my boyfriend’s dismay. He likes variety or something crazy like that! Thus, my latest mission: expand my meal horizons and try some new foods, new recipes, and new meals! Since my boyfriend and I’s meals tend to revolve around our protein source, my first Moink Box came at a perfect time! 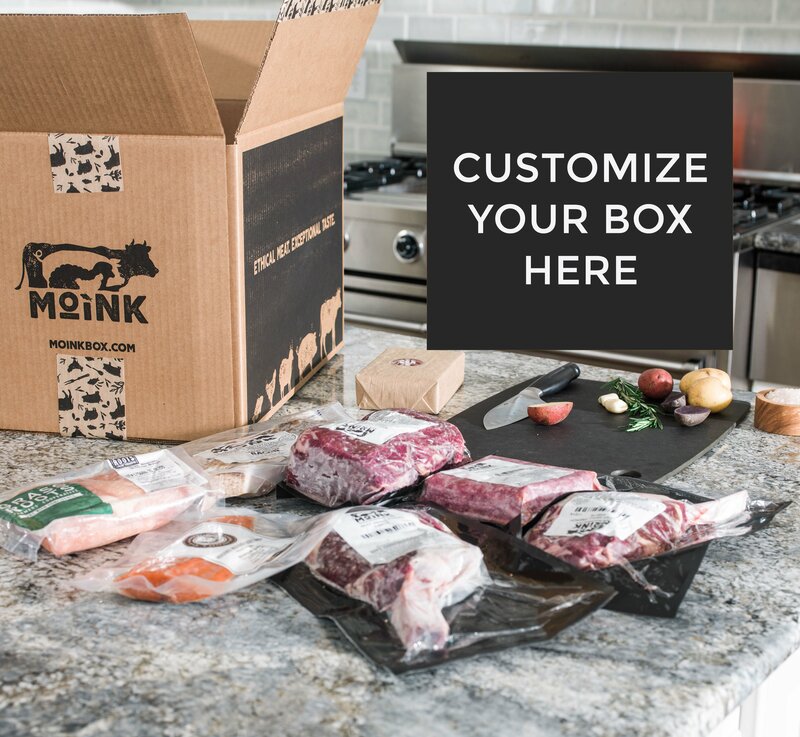 Moink Box is a meat subscription service with a mission to provide people with ethically sourced meat. Pretty cool and I’m a sucker for companies with social missions! They have several box types to choose from, all containing different meat combinations. I went with the beef, chicken, and salmon box and chose not to substitute any cuts of meat (AKA push myself outside of my comfort zone and attempt to try ALL the cuts of meat). My first cut of beef to tackle: Chuck Roast. I have to say, chuck roast looks pretty intimidating. It’s a big ole hunk of meat! However, the recipe below was so easy and delicious. It got both the boy and I’s seals of approval! I will say though: this is not the most “macro friendly” cut of meat. It’s high in fat. However, eaten in moderation, it works with my diet-style AND makes the boyfriend very happy. Win-win! This recipe was inspired by two amazing recipes – Grazed and Enthused for the ingredients & Healing Gourmet for the cooking method. Mix the Himalayan Pink Salt, Cinnamon, Ginger, Thyme Leaves, & Turmeric in a small bowl. Set aside. Click “Saute” button on your InstantPot and add the Coconut Oil. Next, you will “brown” all sides of the Chuck Roast. When simmering, add Chuck Roast and let sit for 2-3 minutes. Flip Chuck Roast to another, un-browned side and let sit for 2-3 minutes. Repeat until all sides are browned. This will help the roast retain the flavors during the cooking process. Sprinkle mixture from Step 1 onto Chuck Roast and rub in with a cooking utensil (I used a spoon). It’s okay if mixture does get on sides of roast or if it falls to the bottom of the pot. Slowly pour 2 cups of Water around outsides of Chuck Roast. Close and lock lid. Click “Manual” on InstantPot and set for 70 minutes. I chose to use my shredded beef in an egg white and cheese omelette! I topped my omelette with salsa and served with sides of sauteed zucchini and cinnamon mashed sweet potatoes, topped with peanut butter. A winning meal!